GUAYAQUIL, Ecuador - At 100 years old, she became bedridden and so weakened from a stomach ailment that a priest administered last rites. 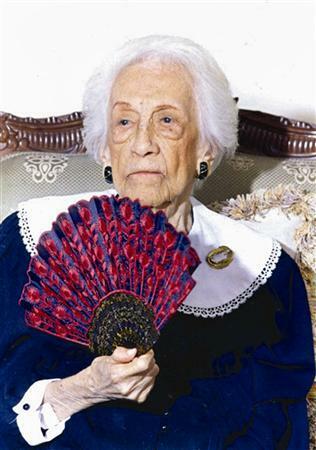 But Maria Esther de Capovilla recovered, and 16 years later she has become the oldest person on Earth, according to Guinness World Records. "We see the condition she is in, and what is admirable is not only that she reached this age, but that she got here in this shape, in very good health," Capovilla's daughter, Irma, told an Associated Press reporter at the home where her mother lives in this coastal city. Seated on a sofa and waving a fan with a slender, steady hand in the tropical heat, Capovilla seemed bemused by the presence of strangers. Irma, 79, leaned close to her mother's ear, and speaking in a loud voice, told her she was famous because she was the world's oldest person. Three of Capovilla's five children — daughters Irma and Hilda, 81, and son Anibal, 77, — are still alive, along with 10 of her 11 grandchildren, 20 great-grandchildren and two great-great grandchildren, the last of whom was born in February 2003. At night, she has coffee with hot milk and bread with cheese or jam, and she says she can't do without something sweet: gelatin, ice cream or cake.